On this page, I wanted to preserve the three images that were already on the page: two vintage camera images on the left, and a vintage woman on the right. I began by using applying several colours of Distress Ink through a stencil using blending tools. I purposely avoided getting ink on the images themselves. Then, to highlight the images I wanted to save, I used bling to create a square that framed each image, allowing the image to spill outside of the frame. I used a blending tool with gray ink, and blended away from the bling. My hope was to draw attention to the three frames showing the pictures beneath. 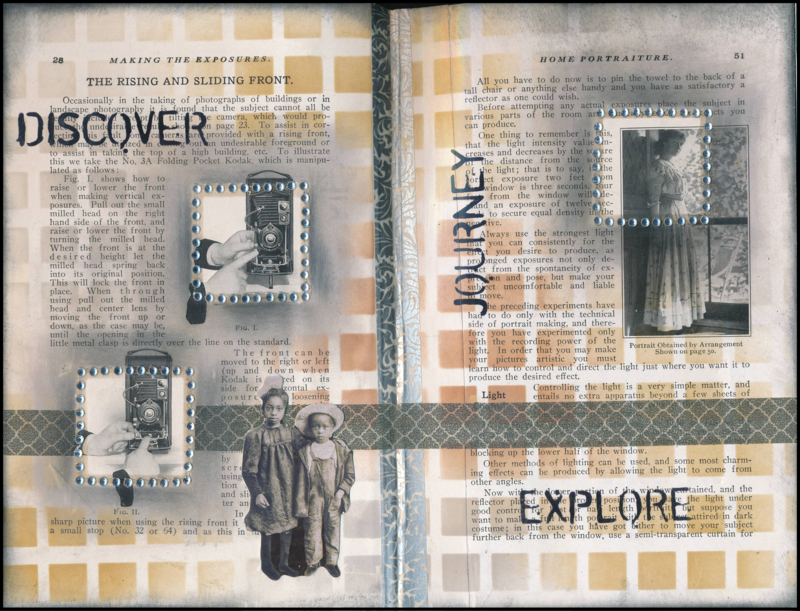 I added a strip of gray washi tape across both pages to tie them together, and then stenciled the words “Discover” and “Journey” and “Explore” with black Archival ink. The two cut-out children are from the Tim Holtz collection. Lastly, I inked around the edges of the page with black Distress ink using a blending tool. One more thing: this was one of several pages that was spitting at the spine. I used washi tape to hold the pages to each other (a trick I often employ!) I like the way the page balances out with the warmth from the ink combined with the coolness of the greys.